Rock Head Protects the Pok�mon from recoil damage. This Pokemon does not receive any recoil from moves. Lightningrod The Pokémon draws in all Electric-type moves. This Pokemon takes damage from Electric moves aimed at its partner. Battle Armor* The Pok�mon is protected against critical hits. No moves will critically hit this Pokemon. has ever seen this POK�MON's real face. and emits a plain� tive and mournful sound. Ruby/Sapphire CUBONE pines for the mother it will never see again. Seeing a likeness of its mother in the full moon, it cries. 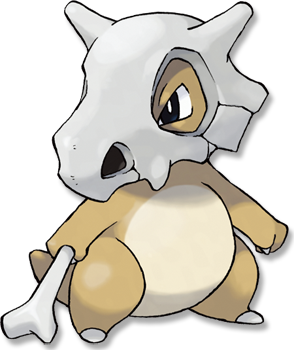 The stains on the skull the POK�MON wears are made by the tears it sheds. Emerald It pines for the mother it will never see again. Seeing a likeness of its mother in the full moon, it cries. The stains on the skull it wears are from its tears. Leaf Green Because it never removes its skull helmet, no one has ever seen this POK�MON�s real face. Diamond/Pearl When it thinks of its dead mother, it cries. Its crying makes the skull it wears rattle hollowly. Platinum When it thinks of its dead mother, it cries. Its crying makes the skull it wears rattle hollowly. Heart Gold If it is sad or lonely, the skull it wears shakes and emits a plaintive and mournful sound. Soul Silver It always wears the skull of its dead mother, so no one has any idea what its hidden face looks like. White When it thinks of its dead mother, it cries. Its crying makes the skull it wears rattle hollowly.